Sprayway 946 Silicone Spray is a dry, colorless, non-staining, waxless friction reducer. Use as a lubricant, release agent, water repellent, protective coating, and polish. Regular use of Sprayway No. 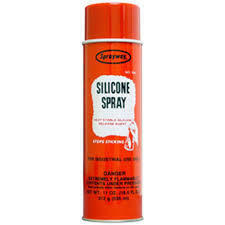 946 Silicone Spray speeds fabric or thread flow, and makes everything move easier for sewing trades and industrial maintenance personnel, reducing downtime and increasing production. This friction reducer results in speedier clean-up of parts and equipment and increased production through cleaner job processing. It is also heat stable - unaffected by temperatures ranging from -40°C (-40°F) to over 200°C (392°F). Sprayway No. 946 complies with FDA regulations applicable to the food packaging/food processing industry. For use on equipment such as: ovens, freezers, conveyors, belts and chutes. No. 946 may be used on food processing equipment as a protective anti-rust film, as a release agent on gaskets or seals of tank closures and as a lubricant for machine parts and equipment in locations with exposure of the lubricated part to food.